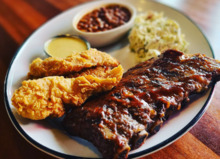 Half slab of 'center cut' baby back ribs and hand-breaded chicken fingers with your choice of dipping sauce. Served with your choice of two side items. 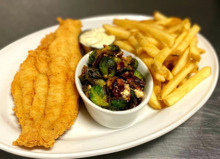 A hearty catfish filet, hand battered in our kitchen and fried. Served with your choice of two side items and tartar sauce. Fresh 10 oz. chicken breast hand battered in our kitchen and fried. Topped with country gravy and served with your choice of two side items. 8 oz. top sirloin hand-breaded in our kitchen and fried. 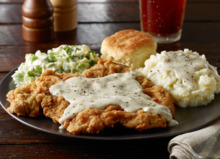 Topped with country gravy and served with your choice of two side items. Hand-breaded chicken tenderloins with your choice of dipping sauce. Served with your choice of one side item. 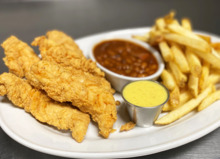 Hand-breaded chicken tenderloins with your choice of dipping sauce. Served with your choice of two side items.